Thirty percent of U.S. adults say they help a loved one with personal needs or household chores, managing finances, arranging for outside services, or visiting regularly to see how they are doing. 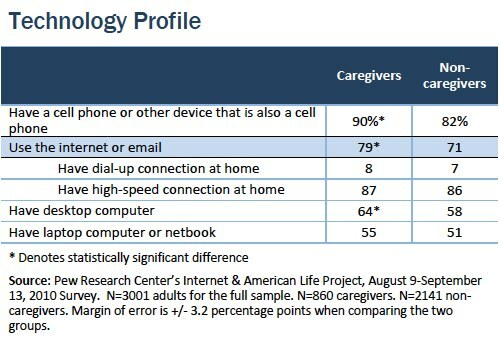 While we did not ask caregivers directly about the impact of the internet on their delivery of care to their loved ones, there are patterns in the data indicating that the impact is significant. 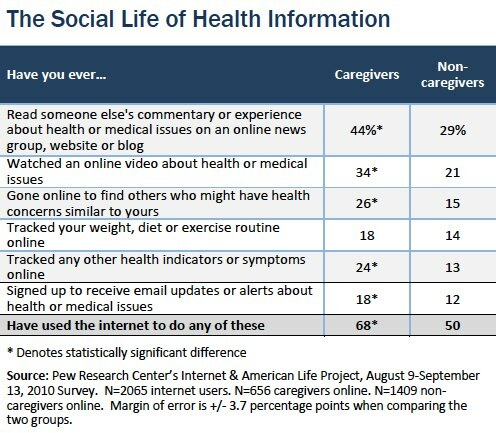 Caregivers make extensive use of the internet for health information, over and above what they may do for their own health situation. The report is primarily based on a national telephone survey conducted in September 2010. Although the data set is two years old, we believe it is still relevant since many of the trends we describe change very slowly, such as the percentage of adults who care for loved ones and the use of the internet to gather health information, neither of which have changed appreciably since the Pew Internet Project began tracking those activities in 2002. 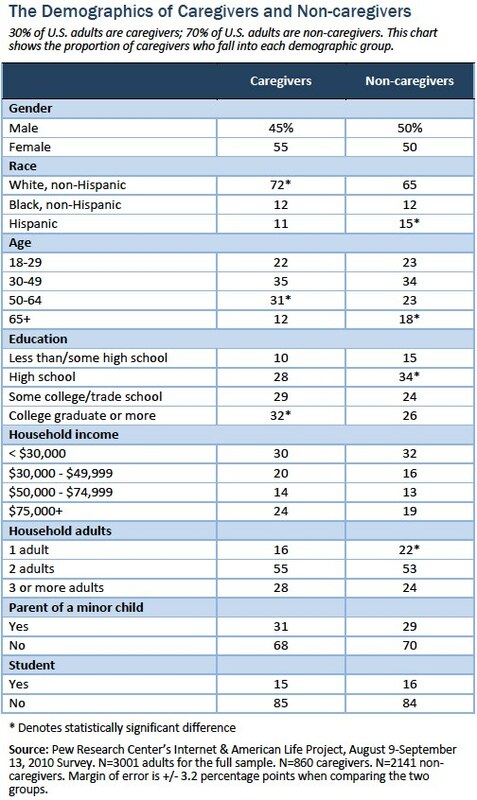 In addition, the demographic data we collected matches the findings of a more recent survey by the AARP Public Policy Institute.2 Where possible, we have used 2012 survey data by the Pew Internet Project to update more fast-moving trends, such as the use of social networking sites. Women are slightly more likely than men to be caring for a loved one, as are adults ages 50-64, compared with other age groups. Caregivers are more likely than other people to report that they themselves are living with a disability, 34% compared with 24%. The call to aid a loved one cuts across all other boundaries: those who work full-time and those who are retired; those who have children at home and those who do not; those who are married and those who are single; those who enjoy a high income and those who do not. All of these groups are equally likely to say they are caring for an adult or a child who needs their help. In addition to being likely to have recently experienced a personal medical emergency, caregivers are more likely than other people to report that someone close to them has faced a serious medical crisis in the last 12 months: 44%, compared with 21% of non-caregivers. Based on this data, caregivers seem likely to be people who are familiar with the route to their local emergency room. Statistical analysis shows that when all other demographic factors are controlled, being a caregiver in and of itself is independently associated with someone’s likelihood to use the internet. 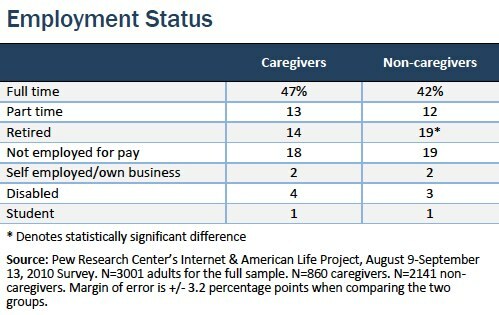 Fully 79% of caregivers have access to the internet. 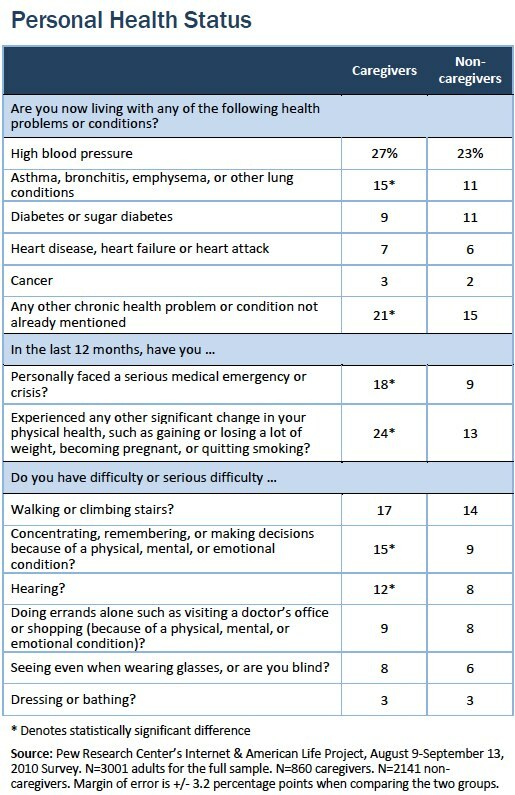 Of those, 88% look online for health information. They outpace other internet users when it comes to researching every health topic included in Pew Internet’s surveys, often by double-digit margins, as seen in the table below. In testing the statistical significance of the relationship among demographic factors and various topics, we found that being a caregiver, having attended college, living with a chronic condition, and having experienced a recent health change or health crisis oneself are all associated with a greater likelihood of researching health information online. When other demographic factors are held constant, including one’s own health status, being a caregiver is correlated with an internet user’s likelihood to say they have looked online for information related to memory loss, dementia, or Alzheimer’s disease as well as information about long-term care for an elderly or disabled person. Other categories with similar, but somewhat weaker correlations include research about information about a specific disease or medical problem, a certain treatment or procedure, and drug safety. However, a group of people is poised to act: their loved ones. Caregivers are significantly more likely than other internet users to say that their last search for health information was on behalf of someone else: 67% vs. 54%. 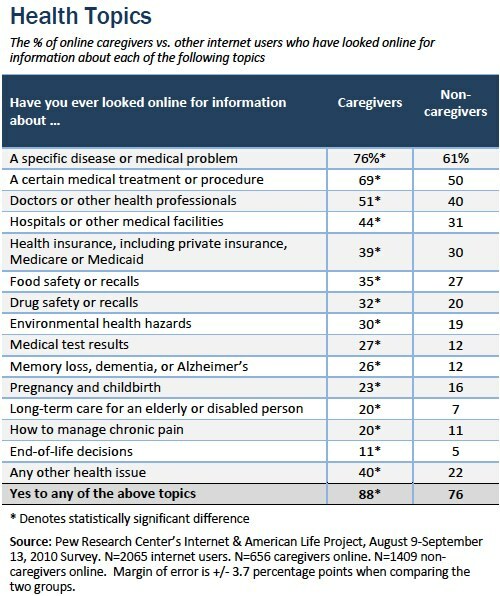 Just 29% of online caregivers say their last search was solely focused on their own health or medical situation, compared with 40% of non-caregivers who go online for health information. 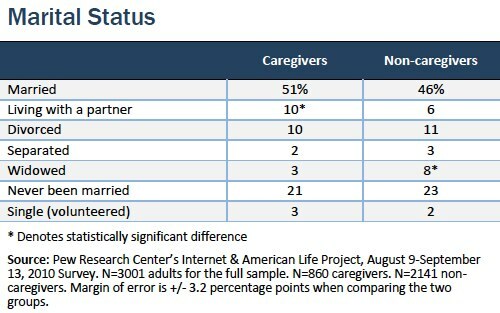 In the caregiver definition Pew Internet uses in our national surveys, we include unpaid care to a child for an ongoing or serious short-term condition, emotional or behavioral problems, or developmental problems. When my child was diagnosed, I left everything and turned to research this disease. I promised myself that my life would be driven by efforts to make my child’s life normal and to give my child tools for handling these handicaps in a positive way. So far, so good. He has the tools, he lives life to the fullest. He is married and totally independent of me. Though he lives hundreds of miles away, he knows I am standing behind him, and when he needs help, I am there in a nano-second. We had to keep a façade of strength those first years and became self-sufficient and found happiness around us. In fact the fortress we had erected around us regarding our son’s disease helped us and, more importantly, him, lead a normal life. The façade of well-being seeped into us. It is a drama that was reflected in many of the other essays: people surround an ill loved one with support—physical, emotional, and now virtual. Unfortunately many caregivers’ stories are not so happy. As one caregiver wrote, “I have spent many lonely desperate nights online looking for more information that might create a change for us.” Caregiving can be a long and unforgiving journey, sometimes ending only with the loved one’s death. Our national phone survey found that 26% of internet users caring for a loved one say they have looked online for someone with health concerns similar to theirs. By comparison, 15% of internet users who are not currently caring for a loved one have looked online for someone like themselves. Social networking sites like Facebook continue to grow in popularity, fast becoming a meeting place for a wide range of communities, including health-related ones. A February 2012 Pew Internet survey found that 66% of adult internet users have a profile on sites like Facebook, LinkedIn, or Google+. 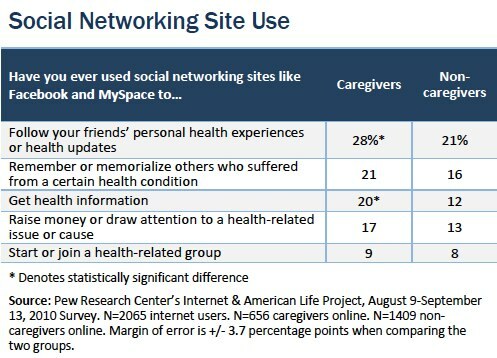 Caregivers are more likely than other internet users to say they follow their friends’ personal health experiences and to get health information on these sites. 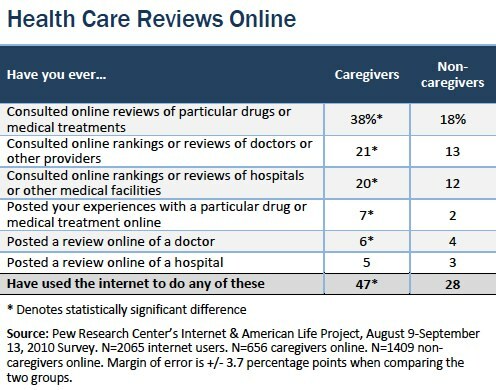 Caregivers are more likely than other internet users to have consulted—and written—reviews of clinicians, medical facilities, and drugs online. Indeed, statistical analysis shows that when other demographic factors are controlled, being a caregiver in and of itself is independently associated with an internet user’s likelihood to consult all three types of online reviews. Other factors contributing to an internet user’s likelihood to do this type of research include: having attended college, living with a chronic condition, being white, having an annual household income of $50,000 or higher, or having recently gone through a personal health change. Most people say that the last time they had a health issue, they got information, care, or support from a doctor or other health professional, either online or offline. Fully 78% of caregivers say that, compared with 66% of non-caregivers. What is more striking is how caregivers tap into their personal networks: 70% of caregivers say that they turned to their friends and family members, either online or offline. By contrast, 47% of non-caregivers did so. Twenty-eight percent of caregivers say they turned to others who have the same health condition the last time they had an issue, compared with 17% of non-caregivers who did so, either online or offline. 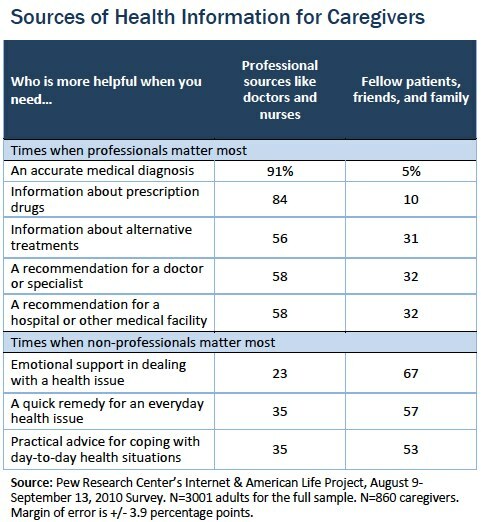 When asked who is more helpful when they need an accurate medical diagnosis or information about prescription drugs, the overwhelming majority of U.S. adults answer “health professionals like doctors and nurses,” rather than fellow patients, family, and friends. Caregivers echo these sentiments. However, when it comes to emotional support in dealing with a health issue, 59% of adults say that their friends, family members, and peers are more helpful than clinicians. Caregivers are especially likely to say this—67% agree. This split view—that clinicians are more helpful on technical or medical issues while other sources are more helpful on practical or emotional issues—is particularly pronounced among caregivers. In fact, the one question which divided the general population evenly between professionals and peers—practical advice for coping with day-to-day health situations— elicits a decisive response from caregivers. Fully 53% of caregivers say fellow patients, friends, and family members are more helpful when it comes to practical tips, compared with 46% of all adults. Most people are more likely to report that the internet has been helpful, rather than harmful, when it comes to their health or the health of people they know. Caregivers are no exception. By comparison, 30% of all adults report that they or someone they know has been helped by following medical advice or health information found online. And just 3% report harm coming to them or someone they know because of online advice. Statistical analysis shows that when other demographic factors are controlled, being a caregiver in and of itself has an independent association with the likelihood that someone will say that the internet was helpful. Other factors associated with finding the internet helpful include: having recently gone through a personal health crisis, having attended college, having someone close to you go through a recent health crisis, a recent change in one’s personal health status, being white, and living in a household with an annual income of $50,000 or more.